Leota, better known as Skip, passed away on July 17th, 2018 at the age of 99. She is survived by her son Don Kitchel, daughters Nancy Margeson and Sandy Burgess, and son-in-law Jim Burgess. She is preceded in death by her son Dennis Anderson who sadly passed away on July 18th, 1995. She loved her eight grandchildren, thirteen great-grandchildren, and three great great-grandchildren. She was very close to her great grandson Colton who took very good care of her when she lived alone in an apartment in Eatonville. He would even go to lunch with her at the senior center when she asked him. She always said it was one young rose among 30 old thorns, but she loved having him there with her. 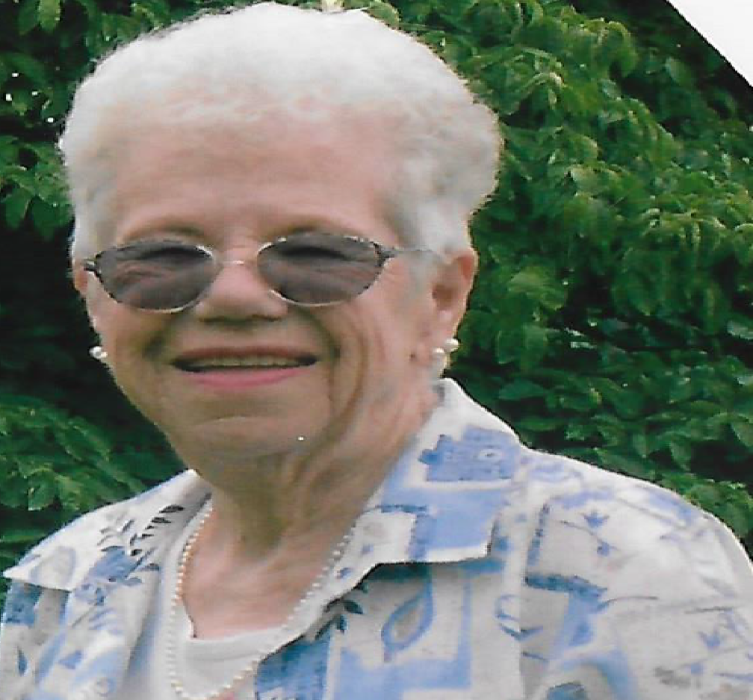 She also had a lot of grandchildren who pitched in whenever they were needed, especially during the two moves from Eatonville to Sumner’s assisted living and then again to University Place Care Center in a short period of time. Skip was blessed with a lot of caring family and friends and she loved them all. Skip was born in Grand Island, Nebraska on April 14th, 1919 to George and Tillie Lovell. At the age of fifteen she came to Washington State with her parents and her brother Bill. She told people that they looked like the family in the movie The Grapes of Wrath with Henry Fonda, having a crate of chickens on top of the car. Once when they stopped for gas the station owner said they gas was on him as they looked so down and out. She married Ed Kitchel in 1936 and that marriage produced three children before it ended. Later she met a wonderful man named Kenneth Anderson, better known as Bud. They married on January 7th, 1949 and welcomed their son Dennis on July 23rd, 1953. Bud’s marriage to Skip was an indication of his true personality. Not many would take on the responsibility of a wife and three small children. The whole family moved to Eatonville, WA where all the kids attended school until their respective graduations. After retirement Bud and Skip traveled south in their travel trailer for the winters returning to Eatonville for the summer to be with family and friends. During these years their family loved to go fishing, clam digging, crabbing, and camping with friends. Skip spent over sixty years in Eatonville. They were married until Bud passed on July 5th, 1993. Nancy remembers a time when Skip couldn’t find her car at the Puyallup Shopping Center and in a panic called Don’s wife Gayle at work to come help her track it down. Nancy said she thought it was funny but now that she’s older she admits she has the same trouble finding her car. There was also the time in an old mail boat that was going up the Rogue River on a day with a beautiful blue sky that a seagull decided to “drop his gift” which landed on Skip’s face and entirely covered her sunglasses. Her only comment was “Why me?! Why me? !” Over the years all the adventures she had often came with very funny stories and the entire family enjoyed them. Skip enjoyed them too and she was always one to laugh at herself as much as her family did. Skip worked as a waitress to help with expenses of raising four kids and later, when they had grown some, as a sales clerk at Christensen’s department store. She always said that raising four good kids was her best accomplishment. Skip was a member of Eatonville Eagles and even served as Madam President of the Fraternal Order of Eagles. After Skip met Hal Clements she was able to enjoy some of the activities she did before they met, until he passed in 2014. The most important thing in Skip’s life was her family and she especially enjoyed the family get-togethers. She didn’t hesitate to tell you if she felt it had been too long since you had visited her, called her, or took her someplace. She loved to go to the casinos to play the slots. After Hal passed away she had to rely on friends and family to take her as she didn’t drive. They never took her as often as she wanted. She loved the casinos! She lived in Eatonville for over sixty years until it was time to go to an assisted living home in Sumner, WA. She fell and broker her hip on April 29th, 2017 and was unable to take care of herself any longer. At the age of 97 this made it necessary for her to go to I.P. Care Center in University Place, WA where she remained until her passing. Thanks to her family and many friends Skip lived a full life of ups and downs. She lived life to the fullest and she will be missed. The family knows she is smiling down on all of them now that she’s safe in Heaven with Bud and their son Denny. Mom, we love you.